In this document we explain how to create an Image Gallery in WS.WebTV. • If you want to create more than one Gallery then the "Galleries+" extension is required. (A) To create a new Gallery click on "New Gallery" button. (B) To edit an existing Gallery click the corresponding "pencil" icon. The creation and edition interfaces are very similar, however, when you are editing a Gallery you will see additional options. • Title: Enter the Gallery title. • SEO Description: This description will be used for SEO and as excerpt when listing the Gallery on search result pages, etc. • Tags/Keywords: Write some representative keywords (comma-separated). • Image: Supply an image (4:3 preferable) to use as main image. If you are using recent versions of Chrome/Safari, Firefox or Opera, you can drag and drop your image file to the image field. • Allow Comments: To enable/disable comments for the Gallery. 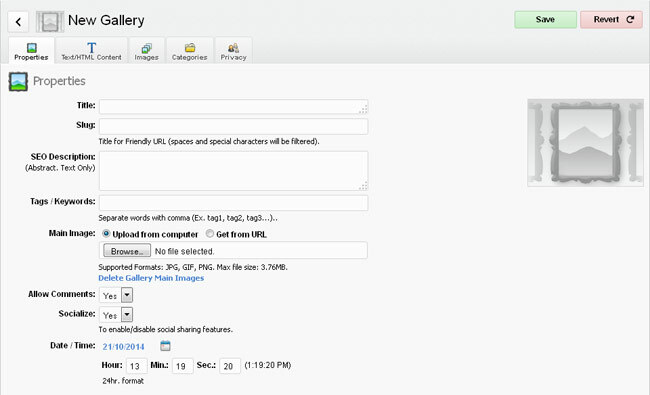 • Socialize: To enable/disable the social sharing options for this Gallery. • Date/Time: The date/time of the Gallery. 5.1.1. Click "New Image": A new empty entry will be added to the list. 5.1.2. Enter a Title and the image file (.jpg, .gif, .png). The description is optional. 5.1.3. Images will not be uploaded until you save the Gallery. 5.1.4. Repeat steps 5.1.1-5.1.3 as required. NOTE: The server may limit the number of simultaneous uploads (you will receive a warning if the limit is reached). 5.2.1. Click "Upload Multiple Images": An upload box will appear. 5.2.2. Click Browse to select the images (or - on modern Web browsers- drag multiple images into the box). NOTE: The server may limit the number of simultaneous uploads (you will receive a warning if the limit is reached). 5.2.3. A preview of the selected images will be displayed. On this tab you can associate the Gallery with one or several Categories (optional). Once you are done editing the Gallery, click the Save button. New Galleries are inactive by default. In order to activate a Gallery, return to the Gallery list and click the "gray light bulb" icon (it will turn to yellow when active). 2. Click on "New Widget..." button and select "Gallery List". A new empty entry will be added to the list. 3. Enter the Title, CSS class (optional), Number of Galleries for the list, as well as the Ordering.